Post-party. Post-coital. Ante Meridiem. Alex Turner is home alone, even if tonight’s companion is still there. Anomie is his only friend. “Satisfaction feels like a distant memory … All I wanna hear you say is ‘Are you mine?'”. There’s no reply. His friends only call him when they’re high. And when he goes around to someone else’s place, it’s so anonymous he feels like he’s been there before. ‘I Wanna Be Yours’, he sings. I wanna be someone’s, anyone’s, he could have sung. These feelings are always there, but they’re most intense in the wind-down time in the earliest part of the morning. A.M. The triumph of the Arctic Monkeys’ latest release is that the theme of the singer who can’t connect is expressed brashly, utterly self-assuredly, and very, very funkily. The bass is the driving force. It’s glorious. The percussion only just behind. The songs are irredeemably catchy. There’s no excess. There’s only a single, short guitar solo on the whole album. Everything is wonderfully focused. Beautifully compressed. And Alex Turner has a fantastic delivery. Gone are the most of the Sheffieldisms, though “summat” remains in the opening track. What stands out is the phrasing. “Found” and “Around” on ‘Fireside’. There’s more than a hint of John Lennon and some clear nods towards rap. There’s not a single bad song and most of them are among the best of the year. 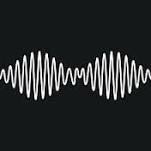 Only on a couple of occasions, ‘I Want It All’ and ‘Snap Out Of It’ do they sound more like The Black Keys than the Arctic Monkeys. And The Black Keys are great too. There’s also an element of surprise. ‘No. 1 Party Anthem’ is a slow and catchy sing-along number, rather than the fast and catchy sing-along number that it seems to promise. And just when you think that life is totally empty, up pops ‘Arabella’, “She’s got a Barbarella silver swimsuit, And when she needs to shelter from reality she takes a dip in my daydreams”. It’s about the only relief Alex Turner gets from dancing on his own. This may be the sound of someone saying things at night “that you can’t say tomorrow day”, but what a sound. Posted in Arctic Monkeys and tagged as Arctic Monkeys, Music, Review.